The United Nations High Level Political Forum on the Sustainable Development Goals was established in 2012 to further the implementation of the SDGs and the 2030 Agenda. It convenes in New York every July, with specific SDGs coming up for review. However, the annual process is far more complex than it might at first sight appear. This article will briefly outline parts of the process in which RIPESS and URGENCI have participated. The process includes some possibilities for CSOs and NGOs to interface with the State processes. In spring there is a first opportunity to interface through input to documents that will be up for discussion and that will contribute to the Ministerial Declaration. This is done through the various UN Major groups. RIPESS does not currently belong to any of the Major groups and will consider doing so. This will immediately increase RIPESS’ ability to make meaningful collective input to the SDG process. Urgenci has participated in the Food and Ag Cluster exchanges, but not in the Agriculture Major Group, as this space has been considered as too challenging by the social movements for some years. (Deeply monopolised by the agribusiness interests). Emily Mattheisen from FIAN has now offered to help coordinate input from the Food and Ag Cluster which will also be a positive improvement. The second and possibly the most interesting space through which to input is in the Expert Group Meetings that take place approximately 2 months before the HLPF. This is where the input on the specific SDGs that are up for review that year occurs and feeds into the Ministerial Declaration of the HLPF. We had the opportunity in 2017 to participate in 2 EGMs, and it was a highly fruitful experience. 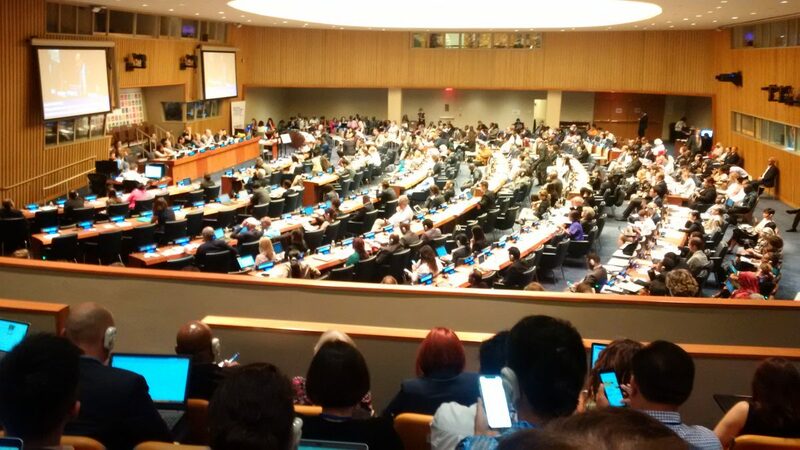 Sadly, at the moment when the EGM on SDG 12 (Responsible Consumption and Production) took place in May it was not possible for us to go to New York. It might have been possible to input to a small extent in the daily Majors group meetings. However these early morning sessions were really too difficult to attend given the tight schedule. In terms of the HLPF, the SDGs that were up for review this year were SDG 11, on cities. The Global Platform for the Right to the City was present in great force, and this movement is key for RIPESS. We joined the Platform in 2015. We supported them throughout the week we were present in New York, but in the official sessions and in side events and at their stand. One of the important and innovate events was an official session on July 17th with Mayors of key cities. Their side event that took place outside the UN at the Bronx Community `garden was a delight. The UN Special Rapporteur on the Right to Housing is one of the most dynamic young women I have ever met, and her interventions at various moments were a delight to listen to. The second SDG that was up for review was SDG 12 on sustainable consumption and production. This is a key SDG for RIPESS and Urgenci, as SSE is centred around these very principles. This would have been the ideal moment to input on Solidarity Economy and also on Food Loss and Waste (SDG 12.3). We tried to gain access to providing some useful input during the session during the session on SDG 12, but were unable to do so. The NGO intervention on this subject was pro-private sector and quite unhelpful to our objectives. This is a great shame, as Urgenci had led the moderation of the Civil Society working group in the Committee on Food Security and Nutrition in 2014, and negotiated an excellent policy document there that we could have carried over to New York. The third relevant SDG that was up for review is SDG 15, on biodiversity. Again, for both SSE and the food sovereignty movement, this is a key SDG, where we could have made a real contribution, rather than leaving the floor open to interventions that were less so. Preserving agro-biodiversity is key to maintaining human nutrition, rather than including fortified processed foods produced by agribusiness. We also attended one day of the National Voluntary Review process. The Latvian review was perhaps the most genuine and convincing. That of Mali was collective, yet somehow at odds with some of the facts we know on the ground through our food sovereignty and SSE networks. There is still a largely unrecorded and invisible positive reality that SSE needs to better document and promote. In conclusion, our participation in this event strengthened our belief already expressed in 2017, that to have a real impact in this process, we need to participle deeply in the preparatory sessions in the spring, This is essential if we want to carry the interests of solidarity economy and food sovereignty forward into plenary sessions during the yearly UN HLPF events. However to end on a positive note, we participated in several side events both inside and outside the UN, and strengthened our alliances with various networks.